Sodalite can be confused with the rarer and more expensive lapis lazuli (shortened or casual version of this word is lapis), which is also blue. This post deals with how to tell them apart. Sodalite is a mineral. It is named for its sodium content, consists of the elements sodium, aluminum, silicon, oxygen, and chlorine. It belongs to a group of minerals called the feldspathoids, which resemble feldspars but have a different crystalline structure, a much lower silica content (i.e., feldspathoids are never found in rocks congaing primary quartz), and contain sulfur or chlorine. 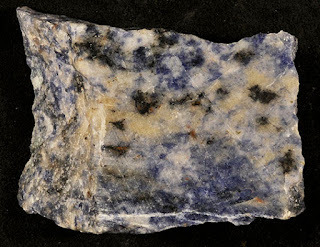 Sodalite is an ornamental gemstone and is commonly used in jewelry or in making bookends, etc. It is best known for its blue color, but it can also be gray, yellow, green, and commonly mottled in color. It commonly has white veining. It rarely has inclusions of pyrite, and it is not opaque (thus light can transmit through its edges). Bookends made of sodalite. They are 13 cm hight. Other side of the bookends shown above. A small piece of sodalite (5 cm maximum dimension) with a polished surface. Sodalite has poor cleavage, therefore, it is useful for making carvings of animals. This mineral is commonly found as vein fillings in plutonic igneous rocks (such as nepheline syenites). Associated minerals are microcline, albite, calcite, fluorite, and baryte (barite). It is found in Canada (Ontario, Quebec, and British Columbia), as well as in Maine and Arkansas. 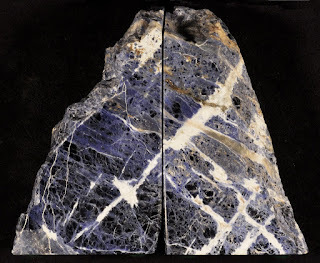 Sodalite is a "poor man's lapis lazuli." Lapis lazuli is a metamorphic rock. 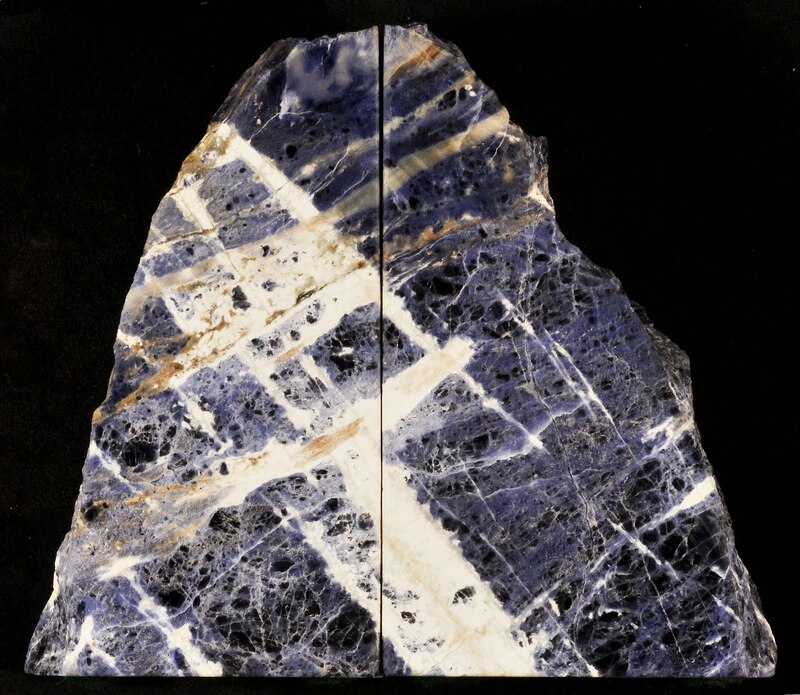 The most obvious and important component of this rock is the mineral lazurite, a feldspathoid silicate mineral consisting of sodium, calcium, aluminum, silicon, oxygen, chlorine, and sulfur. It is the presence of sulfur that gives lazurite its intense deep blue color. Most lazurite also contains the minerals calcite (white), sodalite (blue) and sparkling pyrite, as well as small amounts of mica, hornblende, etc. The gem form of Lapis lazuli has been prized since antiquity for its deep-blue color. 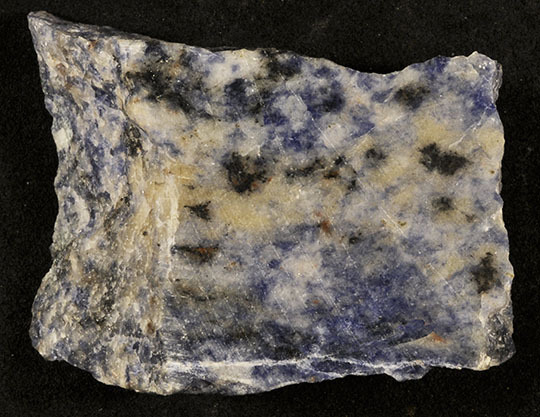 This rock has been mined for thousands of years in Afghanistan and Pakistan (note: "lapis" is an Arabic word). It is opaque, thus light does not transmit through its edges. Pyrite is commonly present, but in minor amounts. dimension). Notice the flecks of pyrite. 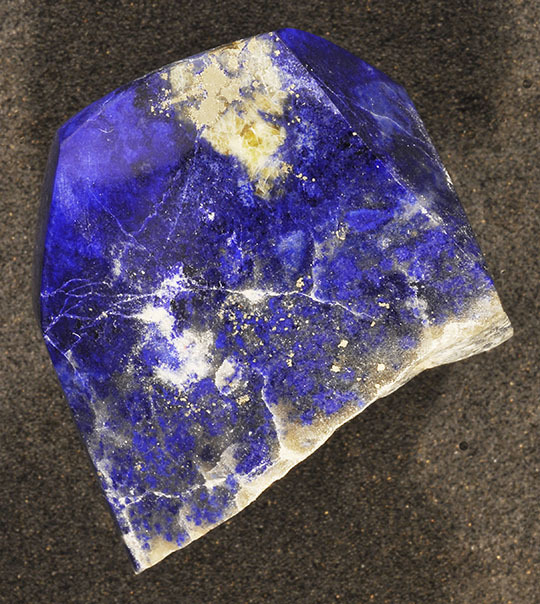 Lapis lazuli takes an excellent polish and can be made into jewelry, carvings, mosaics, ornaments, small statues, and vases.